While the visual and text editor in WordPress are powerful, they can be quite overwhelming and distracting for new users. What most beginners don’t know about is the full screen editor that gives you a clutter free writing environment. It hides all unnecessary menus and boxes from the screen. All you get is a clean white screen to write your content. In this article, we will show you how to use distraction free full screen editor in WordPress. 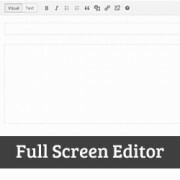 To launch the full screen editor, all you need to do is click on the full screen button in WordPress editor. 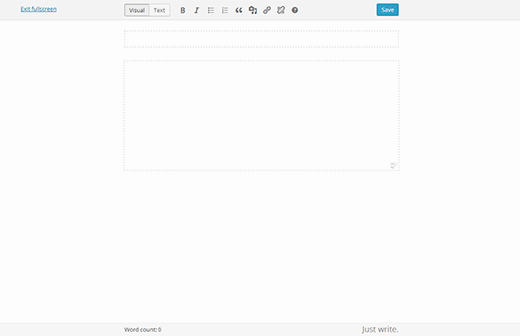 WordPress will now gracefully convert the post edit screen into a clutter free full screen editor. The full screen editor has a minimalist layout. It has a menu bar on top of the screen with very few buttons. The menu bar only appears when you take mouse to the top of the screen. Just like regular post edit screen, full screen editor is also available in both visual and text editor. Switching to text editor will hide all those buttons. You will only see buttons to add links or insert media. Full screen editor does not have a Publish button, or any meta boxes to choose categories and tags. After writing your post, you can exit full screen to select your post options. In our experience, full screen mode allows us to write faster. Several students have told us that they use this distraction free mode in WordPress when writing research papers. We hope this article helped you introduce to the distraction free full screen editor in WordPress.